Ripple Farm's organic vegetable box scheme has been running for over 20 years, providing a selection of 100% organic vegetables and salads weekly to customers in East Kent. New customers receive their 4th veggie box FREE if they pay in advance for their first 3. 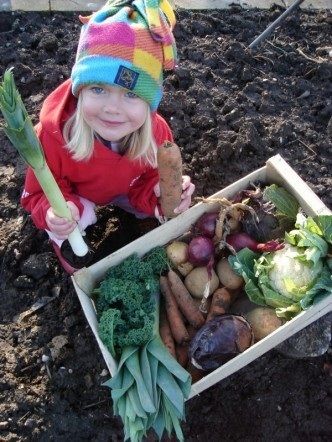 We are proud of feeding so many customers with a varied selection of vegetables and proud that within our box scheme, approximately 80% of the contents (on average) are grown by ourselves. Another 10% comes from another organic grower in Kent and the remaining 10% mainly sourced from other UK organic growers. We grow a big range of vegetables and varieties, and grow our own seasonal salad leaf mixes and bags of stir fry greens. We offer doorstep delivery to Wye and surrounding villages (Brook, Boughton Aluph and Hastingleigh) and we use the amazing services of Velocity Couriers, to deliver our organic veggies to Canterbury by bike and trailer. We also deliver our veg boxes to collection points in Ashford, Bridge, Canterbury, Faversham, Folkestone, Hythe, Lyminge, Saltwood and Whitstable.